On September 10, 2001, Harvey Loves Harvey were in Boston celebrating Jason’s birthday. We spent the day in Hyde Square for the annual festivities, watching mariachi bands, drinking beer and spending time with close friends. As was our custom, Matt had given Jason tickets to see Unwound the next night — repayment for tickets a year previous to see our favorite band on New Years Eve. Of course, the Harveys never saw the show. The next morning as Jason awoke on Matt’s couch, they watched on TV as the towers smoked. That day was, as it was for many Americans, filled with dread and sadness, fear and anger. Missing a rock show was not at all important. In the years that have passed since that sad day, Harvey Loves Harvey has seen how closely those events impacted the lives of people we care about. We have watched as our government has used those events to justify horrible acts, two wars, and ideologies that debase our country to its lowest levels. We have seen some of the worst this country has to offer, all in the name of the events of that morning. For us, this insignificant rock show has always been a marker of what could have been. If we had seen that show, then the events of 9/11 would not have happened. If Unwound had performed, the terrorists had failed. An entirely different and hopeful future became possible if we had finished our day as planned, watching Justin, Sara and Vern with a beer in hand, rather than staring endlessly at the news with our hands over our hearts. 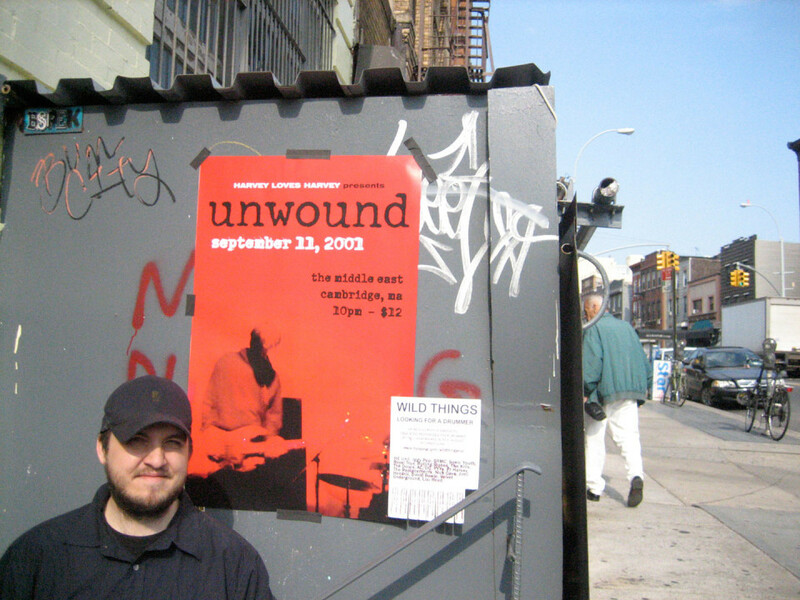 In May 2007, Harvey Loves Harvey created the show that never happened, gathering Unwound fans and HLH supporters in Brooklyn for a single event. While unlikely to reverse the course of the world in the previous six years, we hoped at least to create a moment of hope, of opportunity, to say that things could be different. The existence of this show, the proof that Unwound actually performed on 9/11, states that there was another way, a world in which the towers stand, 3,000+ Americans are still alive, and two wars never found justification for beginning. “Harvey Loves Harvey Presents Unwound Live September 11, 2001 Recorded Live May 12, 2007″ is a series of videos recorded at the event.